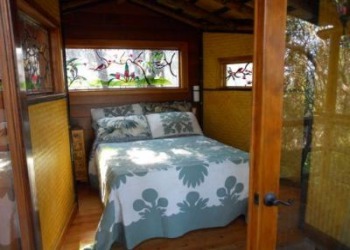 Mahinui Na Lani was designed by internationally acclaimed tree house builder Roderick Romero to fit into this ancient forest as if to welcome Pele herself. We invite you to share the experience of this floating structure anchored to the trees whose roots are wrapped around a lava tube. Centuries ago, when Kilauea spilled lava across what is now a lush rain forest, a giant bubble rose up, and hardened. Lava continued to flow through, to the ocean. Part of the ancient forest that used to form the canopy on this island remains on this site, offering its shelter to all who stay here. Begin and end your adventures on the Big Island in the cedar hot tub. Built to be green, with recycled and locally found materials, and low impact waste systems. Water is by catchment. Mahinui Na Lani is located about five minutes from the entrance gate to Hawaii Volcanoes National Park on the Big Island of Hawaii. A map of the area may give the appearance of a neighborhood, yet as you drive into Mauna Loa Estates, you are surrounded by old rainforest, dense and green. There are houses, so widely separated that ambient light after sundown is insufficient to see your way while walking out at night. The effect is one of serenity and privacy, in the midst of timeless forest. This Treehouse is about a half mile from the main road, across from Volcano Village where you will find restaurants, a gas station. two food stores, and galleries. 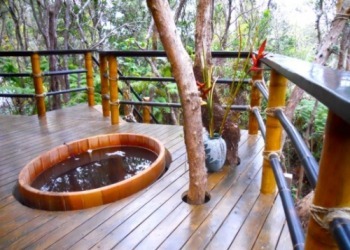 The treehouse is an intimate space designed for two people to share. The hot tub seats two, as does the indoor table and outdoor table. In the downstairs area there is a kitchen with cooktop, sink, refrigerator and microwave oven, indoor seating for sharing meals and drinks, a Jotul propane stove for heat, a comfortable sitting area and small flatscreen DVD player. There is one queen sized bed, accessed up a ship's ladder through a trap door. The shower is outdoors. Toilet is composting. Power is off the grid, using generator, batteries, solar and wind power. This is a true eco-stay, where you will have the opportunity for first hand experience in off-grid green living. 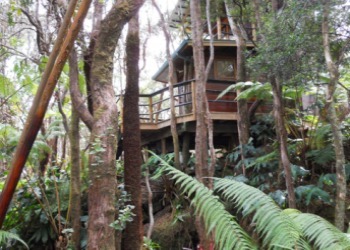 The treehouse can be a part of your volcano adventure - a place to stay unlike either an ordinary vacation rental or standard hotel room.